My son wants to be a guitar player in a "bando." He wants to be an Olympic swimmer, or skier. Either one, or both. He's ready for the pro bowling tour and the New York Yankees will be calling any day now, but mostly he loves his guitar. I'm in love with his enthusiasm for all possibilities, along with his belief that if he says it, then it has to come true. He hasn't experienced enough of life to know that's rarely the case. He still holds faith the world is waiting for him, and isn't it? My hopes are high and I can't stop wondering who he'll grow to be. A very different path was paved for him the day he was adopted out of a Russian orphanage. If life is pre-ordained, was it meant to be he'd come and live with us? I like to think so, or have we disrupted some sort of cosmic order? Will he still be the man he was destined to be? We were told at the orphanage, even at 9 months old, he loved music. He would pull himself up on a chair and move his little body in time to a piano. I remember thinking how sweet that was. Over time it became obvious, he didn't just love music, he thrived on it. He would "blabble" all the time. He'd bang his hand or toy against his mouth and make blabble sounds over and over. He was making his own music. As he got older he'd watch with fascination, musicians of all genres on TV and mimic their movements, whether it was playing an imaginary instrument or instinctively moving his body in ways good dancers are taught. He couldn't get enough. When he was barely three, he marched determinedly up to my husband and declared he had a guitar in his brain. Maybe he does. Where does he get this? I can't say this love of music was nurtured by me. We don't have a piano here, thousands of miles from his birthplace, and I'm not particularly musical. I can sing a lullabye or two and play some good music in the car, but aside from a brief encounter with a mediocre, toddler music class, that's been about the extent of it. It must be in his nature. He carried this passion with him across the sea to my house and even though, I haven't been very musically nurturing, he never let go of it and it never lost its hold on him. What if from here on out, I don't nurture this love? Will his passion survive? On the other hand, what if I encourage it? Where will it take him? Will music play a strong role in his life forever since it's so clearly engrained in him? If nature and nurture exist so strongly for some things, what about us, the breast cancer thrivers? Are we destined to live out our lives only one way due to the nature of our genes? Are we messing with destiny when we base decisions on BRCA testing, prophylatic and necessary surgeries, radiation, chemo? Are we altering what nature dealt us or are we simply nurturing a bruised body to the best of our ability? We can wonder if the mutations found in our cells are part of our natural biology or were they nurtured by the carcinogens in our environment. We can question whether we truly have control over our choices or is our destiny already etched into our DNA, regardless. As my boy's love of music seems to be. These questions are way too big for me and though, lately I've been giving all of it a lot of thought, I'd really rather not. I try to control some things. I can choose to exercise because it's good for me. I can give up drinking a Friday night beer with my husband because I heard the yeast used to brew it is dangerous for estrogen-positive cancers. The same for soy. Now, I'm hearing almonds, peanuts, and chick peas after believing for years, those were healthy options. Confusion is reigning over my choices, which ultimately leads me to accept, I can only do the best I can. There are still so many things I can't control. The natural aspect of our genes are what they are. The mutations will win or they'll lose, but where we win is in the way we nurture our emotions. We can think positively and set our sights on a future we've chosen to believe is possible. Just like my little guy when he dreams of being in a "bando.". 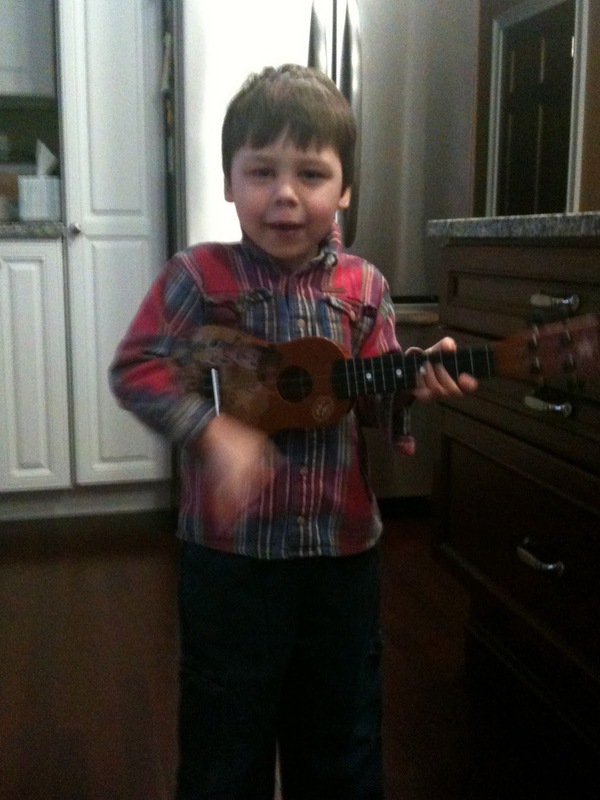 How sweet that your little boy is so musical! Some of the most wonderful composers are Russian...who knows? Gosh, that's quite a post! I don't think that fate or destiny is ever a cut a dry situation, external factors always have their influence, it's what makes us human. For your son; if he is destined to be a musician I truly believe it will happen whether you actively nurture it, or just keep letting him have casual contact with it through out his life. For you; of course you must actively fight, technology is there to help not hinder. Gorgeous pictures of your little rock star! Well said! The best any of us can do when it comes to healthy choices is educate ourselves based on available information, and then adjust accordingly as time and research march on. I agree that it's frustrating that one day's magic bullet is the next day's carcinogen, or so it seems. But despite the contradictory messages from the nutrition front, with every day that passes, advances are made in treatment options and a cure looms much closer for our generation than it did for our moms. That's where hope and dreams play a bigger role, as far as I'm concerned, than genetics ever can, from here on in. Stacey, Quite a post here, and just last week you were wondering what to write about! I have always been fascinated by the nature/nuture issue. I think that's why sometimes it irks me when it almost sounds like people are saying you can prevent breast cancer if you do this and this and don't do that. Like you said, we just have to do the best we can and then accept. Sometimes it is in the genes. Anyway, your little guy is so sweet. I happen to have a son who is very musically inclined and majoring in it now. His music has brought such great joy into our lives, so be sure to nuture that interest! Ginny, please don't take my word on any of the info mentioned here. It's just stuff I read. Enjoy whatever you like! 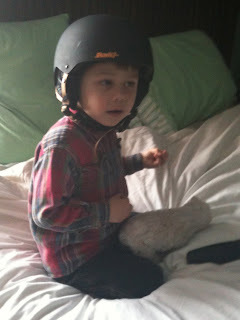 Alethea, thanks for your comments and calling my son a rock star! He loves that. Wendy, thanks as always for your thoughts. You know how much it means to me. Nancy, this was something I had been kicking around in my head for a while, but yes, too many variables. Thanks for telling me about your son.That sounds so nice. Stacey I'm a strong believer in the "nature" theory of development. My sister passed away several years ago leaving a little boy aged five. Watching him grow up now, it's incredible how many of her characteristics and tendencies he has and continues to develop, and since he has lived over half of his life without her, I have to believe that what we're seeing is imprinted on his genes. Unfortunately (or is it fortunately) I believe that the secrets to cancer also lie within our genes. This is where I believe that we will see game-changing treatments in years to come. At least that's where my hopes lie. Great post......you see there is always sooooo much to write about ! Anna, first off, I'm so sorry about your sister. It seems to me, you've been dealt way more than your fair share of sad events. I truly hope 2011 is the start of good things for you and your family. I agree with you about nature, both for the good, as with your nephew and for the power within our genes. I hope you're right and treatments will be able to ultimately win out over that. Thanks for sharing your thoughts here. Stacey-Such an amazing and thought-provoking post. First I really feel for your frustration in dealing with the ever-changing rules about what’s good for us. Although I’m not in your exact shoes, I think your decision to control what you can control is the path I’d take too. I’m not sure I have anything important to contribute, but I wanted to tell you how your thoughts in this post hit so close to my own heart. As a fellow adoptive parent, the nature/nurture question is of course a big one. I have a son who was born a musician too! Picked out harmonies in and sang them in the backseat while still in a car seat. Me? Can’t carry a tune – lol! He’s 21 now and his lack of musical parents didn’t stop him: he’s accomplished a lot in the music world. His big sister also came equipped with an interest that was foreign to us: horses! Begged for riding lessons from age 6. I’d never been in a barn in my life! But she, too, had much success. Having kids with such different interests truly broadened & enhanced our lives. I think we probably had fewer pre-conceived expectations for them than we’d have had if they’d been born to us. At the same time, now that my kids are grown, I see SO much of myself and my husband in each of them – it’s amazing! I’m convinced it’s a combination of nature plus nurture, all the way. I also identified with your ponderings on destiny. For instance, my husband and I came close to moving to another state in our early married years, before we adopted. I’ve often thought: if we’d made that move, we would have adopted different children. Yet, the kids we ended up with are the kids we were SUPPOSED to have. I’m sure of it. I’m betting you know what I mean. But I don’t think believing in destiny has to mean feeling like we have no control or input. To me, our choices and our actions are part of our destiny. As you said… you control the things you can control. “….set our sights on a future we've chosen to believe is possible.” I love that! Barbara, wow, thank you so much for taking the time to share your thoughts. It's nice to get another adoptive parent's perspective. I do know exactly how you feel about your children being meant for you. I always say that our journey wasn't the typical way to have children, but they are ours all the same. I do believe they were meant to be ours, especially, when I see how much they're becoming like us. You also made me stop and think when you wrote our choices and actions are part of our destiny. Yes, I think you're right. There's something bigger than us leading the way and knowing that makes things a bit easier to handle. Enjoy the ride. Thanks, as always, for reading and your comments.